The town’s two senior football clubs are gearing up to host the top two teams in their division tomorrow (Saturday). Bexhill United will entertain second-placed Saltdean United and Little Common are at home to Macron Store Southern Combination Football League Division One leaders East Preston. Both games will kick-off at 3pm. The latter fixture is a particularly big one as Common themselves are in fourth place and very much in with a chance of finishing in one of the three promotion positions. Common player-manager Russell Eldridge said: “It’s a really important game, as all games will be from now on in. The Commoners, who were fixtureless last weekend, are five points behind East Preston and one adrift of third-placed Mile Oak, albeit with two games in hand on the latter. East Preston will arrive at Little Common Rec on a 10-match winning run in all competitions. EP possess the best goal difference in the division, but Common are the highest scorers. “East Preston are going well and they’re a good young team,” continued Eldridge. “But at some point they’re going to drop points and we’ll be trying to make sure it’s this weekend. “I would expect a pretty open game, but both teams I think will be a little bit cautious as well. They like to play and get the ball down as much as we do. “We’ve played them twice already (winning at home in a cup after losing away in the league) and in both games I think we’ve played well. Dan Cruikshank is away and Jared Lusted has work, but dual registered midfielder Bradley Pritchard could well make his debut. 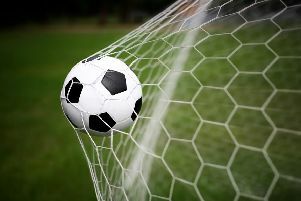 Common will be hoping that crosstown rivals Bexhill can do them a favour by getting a result against a Saltdean side which has won seven and drawn one of its eight matches since losing to Common in December. Bexhill might be six places and 23 points behind Saltdean, but they can draw heart from their two excellent victories away to tomorrow’s opponents back in August. “It’s nice that we’re somebody’s bogey side,” said Bexhill joint manager Ryan Light. “I remember suggesting we thought Saltdean would be strong and although it was early, we knew what a really good couple of results they were down there. Although recent results have been mixed, Bexhill have scored 13 goals in their last four matches and have only failed to hit the net in one game during the last four months. Georges Gouet and Drew Greenall should return, and Dan Rose is close to shaking off a knee problem. Bexhill were this week hoping to complete the signing of their former striker David Pugh from Seaford Town and to bring in Adam Sully from local football.